Motorcycles - Auto Renew LLC. Auto Renew specializes in motorcycle paint. 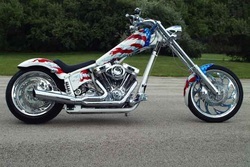 Stock Paint Matching, Insurance Repair on Foreign and Domestic Bikes, Custom Airbrushing and Graphics, Restoration of Vintage Parts, Helmet Painting, Plastic Fairing Repair, Body and Paint on Full Custom Choppers, and Show Quality Paint Work. We also provide great prices on one color sport bike paint jobs. Auto Renew is a full service motorcycle paint shop that provides reliable painting services to individual bike owners, small custom shops, and motorcycle dealerships. We can accommodate a broad range of jobs, from collision insurance repair to show quality full custom work. Our goal is maintain a fast turnaround time and reasonable prices.